I’ve had this recipe in mind since Christmas when one of my Twitter mamas posted information about it. I have been meaning to get new handprints for the boys for a while and now that they’re three it’s finally time to get on the ball. I was feeling motivated by Mother’s Day coming up (to give as gifts to the Grandmas) and we had a play date with good friends which made for an excellent reason to make it a group project. It was much easier than the last time I tried hand prints although having the boys older and able to follow directions made a huge difference. 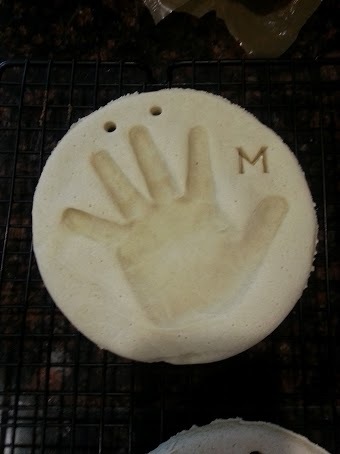 Here’s my recipe for making salt dough to use for hand prints. Knead the dough for 20 minutes or until all ingredients are thoroughly combined. Use extra flour if it feels to sticky but don’t put too much on or it will get too stiff. Spray a cooking sheet or use parchment paper to roll out your dough. You can either do hand prints and then cut out shapes around them or you can do like I did and cut out shapes for your kids to push their hands into. I found a bowl that was large enough to be bigger than their hand and used that. You’ll want the dough to be thick enough that their hands don’t push all the way through. I did about the thickness of my boys’ hands. Place your child’s hand in the center of your shape and press firmly down. I pushed on each of their fingers and an extra push on their palm to make sure to get an even imprint. Poke tiny holes in the dough to avoid bubbles and use a straw to poke a hole or two in the top if you want to hang the hand print with ribbon. Cook in a 300 degree oven for approximately 25 minutes depending on thickness. The finished prints will be soft but look dry and will harden as they cool. Once cooled completely you can paint or draw on them as desired. This will give you a nice outline of the hand but won’t capture the details of the hand unless your kid has deep lines in their hand or you use a wetter dough. Here’s how one of ours turned out. This is after cooking but before painting. We borrowed a stamp from our friend to put the letter in the dough. You can find these stamps in any stepping stone kit. This recipe made enough dough to do six prints for the average three year old hand and we had a little bit of dough left over. This was a quick and easy little project and I’m glad I finally found the motivation to do it!